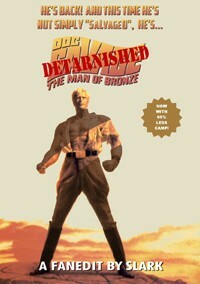 Database Fanedit Listings FanFix Doc Savage: The Man of Bronze – Detarnished! Hollywood lore says that Warner execs were fearful that a serious depiction of a pulp hero would not play to audiences in the mid-‘70s, and that they insisted the film be given a “camp” approach, akin to the 1960s TV series “Batman”. Rumor has it that a “straight” cut of the film does exist, somewhere in Warner’s vault. The idea of this edit was to try to extricate as much of the cringe-inducing “camp” as possible from this film – in effect, imagining what that “straight” cut might have been like. I would like to thank my “advisors” on the fanedit.org forums: Gantz101, Monroville, Jorge, Spence, ImperialFighter, JMB, Blackhawk, Bleujayone, MonkandHam, Dwight Fry, Ray Zell, Ripplin, Hebrides, and imp_ardnfi. And I would like to thank all the past and present administrators of fanedit.org for providing a site that inspires and facilitates all this. There is a much more extensive list of thanks in the crawl that follows the movie, but I would like to single out Mr. Ron Ely – to whom I have dedicated this fanedit – for a wonderful performance that made all the time spent on this project bearable! A guilty pleasure. The Man of Bronze leaps off the written page and onto the big screen with his colorful team in tow. Thank you for salvaging Doc's movie adventure and exposing the little gem that lay hidden under the movie studio's official release. Until we see a full-feature, modern version of Doc Savage (Shane Black and Dwayne Johnson: make it happen! ), this lovely yet clunky rendition is the best Doc outside of the books. That line really cracked me up. I am so glad I finally got to check this edit out. My history with Doc Savage consists solely of going to see this movie in the theater with my dad when I was 7 years old. I remember seeing glowing green snakes whenever I closed my eyes for hours afterwards. It is the only movie I ever saw in a theater with my dad. You have really worked wonders on this. I hadn't seen the movie again since it was in theaters. I was excited when the dvd became available, until I actually tried to sit thru it. The camp aspect gets compared to the 60s Batman TV Show, but in general, I find this movie has what I call a Gilligan's Island sensibility--characters are not affected by climate or situation or common sense. If the bad guy likes wearing black turtle necks and sparkly sport coats, he'll wear them in the jungle, on a boat and possibly to bed. Removing the sequins from the sport coat in the one scene was genius, I thought, because it is just about impossible to improve a movie whose whole sensibility is so ridiculous. But you did improve it dramatically through so many smart editing choices. Of course, I hate the Sousa marches, most of which you removed. Unfortunately, it made some of the remaining ones stand out more. The movie, for me, was really moving along well and then the first fight on the boat features the silly Stars n Stripes music. I'm not an editor, but if I were, I would not change a thing in your edit except changing the music in 3 scenes--none of which feature dialogue. --The fight on the boat, a driving scene and a horse-riding scene (the 3 scenes occur in that order). But then I guess the challenge becomes choosing the right music (on the bright side, you cannot do worse than the Sousa marches). It can't be as well known as the Indiana Jones theme, but if you could find something in that vein but much much more obscure, I think that might make things miles better. (I'm hoping your possible version 2 deals with this. Even in scenes where you have removed the terrible music might be improved by adding the right background music, while keeping the great foley work you did. The fight around the gold pit, I think, was a place that could have used this). The other minor suggestion has to do with the film grain, or lack of it. Again I must mention that I am not an editor myself and therefore can't speak with any expertise. But one thing I didn't like about the movie was how it looked like it was shot on videotape. It looked like an episode of Gilligan's Island or the Brady Bunch. Is there a filter that could give it a more cinematic look? Or could it be letter-boxed without losing too much? "Thank you for getting the Doc Savage fan edit I know that I refused to watch it for a very long time, and I know that you know how deeply scarred I (and other Doc fans) were by that horrible movie. You were wise to start watching it, finally, without telling me what we were watching. "The text introduction was really good – made me want more. I loved the way they changed the beginning of the movie into an old-time newsreel, too. The rest of the movie was almost painless – I don’t think I’ll ever be able to listen to Sousa again without cringing. And finally, the extras helped me to relive that old pain in all its glory…and in doing so, to really appreciate what a fine job was done in paring the movie down to its very best parts. "Please thank whoever the editor was – I didn’t think it could be done!" I liked it, too. I didn't hate the original as much as she did but it was hard to like it. Tony's edit improved it at least an order of magnitude, arguably several. It is actually watchable now without moaning at the bad parts. There aren't any bad parts, now. It is quite an achievement. I appreciate any fan edit but it is something different to start with a good movie and make improvements than to start with a very bad movie and make it decent. Technically, I think it is nearly flawless. The video and audio quality are equal to the source and the edits are smooth and hardly noticable. The amount of fixing of small things that add up to a major change in the tone of the movie is hard to grasp. He went so far as to insert new video and sound effects, something I would not even contemplate trying. BTW, it was my wife who made the request that the kiss at the end be removed as she considered it very out of character for Doc. I appreciate Tony giving her credit for that. And, very belatedly, thanks for your super job. This fanedit is now a very nice old fashioned adventure movie. As the title of the first version of this edit said: it is really Doc SaLvaged. Being a faneditor myself, I rarely try to make a very bad movie better. I usualy prefer to change it into something else. Part because I find it fun. But also part because I know that turning a very bad movie into something good while staying somehow true to the original is VERY difficult. This edit succeed in doing that. I know it was a hard labor of love to complete this work, but Slark stayed focused on his goal and the result is a surprising good old movie. Reviews from all quarters are, of course, always welcome. But there's a special feeling attached to getting a positive review from those who've sat - with distinction - in the editor's chair. So thank you, TMBTM, and a special thanks to Neglify, LastSurvivor, and BionicBob for their reviews. And thanks to all of you for your own contributions to the world of fanediting! This edit is absolutely perfect! I had never heard of this movie before I heard of this edit. So I wanted to see the original, and man was it bad. It was so bad in fact that it's taken me almost a year to watch the fanedit. And I am so glad I did. Slark has turned a bomb into a smashing success. Yeah, I do always try to impress upon my friends that they should watch the fanedit FIRST - for that very reason! Thanks for the good words, Neglify!